Description: Soft and elegant, this sheath wedding dress features cascading lace motifs over tulle. 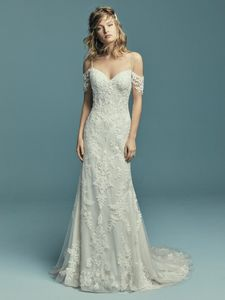 Illusion cold-shoulder sleeves and beaded spaghetti straps complete the sweetheart neckline and scoop back for a romantic feel. Finished with covered buttons over zipper and inner elastic closure.